A Canberra CEO who is sleeping rough for a charity event has shared some of the stories from the streets of Canberra. 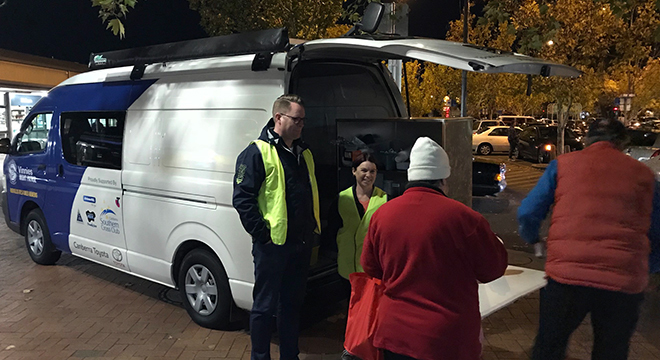 Capitol Chilled Foods/Canberra Milk managing director David Tyack said the plight of the homeless was made very real during a recent session manning the Night Patrol Van. David will be taking part in the Vinnies CEO Sleepout this year, an event that raised $500k in 2017. Thanks to the donations, Canberra now has a new, second Night Patrol Van, so that Vinnies can help those in the suburbs of Canberra as well those in need in the Canberra CBD. People find themselves sleeping rough for a variety of reasons – family break up, mental health issues, addictions, and unemployment. One area that stuck with David from participating in 2017 was the children impacted by homelessness. Vinnies Night Patrol Van is a frontline service to help out those in need with food, hot or cold beverage, warm clothing, blankets, toiletries and also provide an environment for a chat and share the other services available to them from Vinnies. The CEO Sleepout Event is at the National Museum on Thursday 21 June, starting at 6pm. To donate to David, click here, and for more information click here.